La cabeza mató a todos or “The Head that Killed Everyone”, is a mixing of indigenous mythologies with present-day characters, geographies, and culture in Puerto Rico. The title refers to how a shooting star was (in local mythology) interpreted as a head without a body, crossing the sky, signaling the arrival of chaos and destruction. The actor in the video, Michelle Nonó, is in touch with native plants—she’s a medicinal botanist but also a cultural activist. 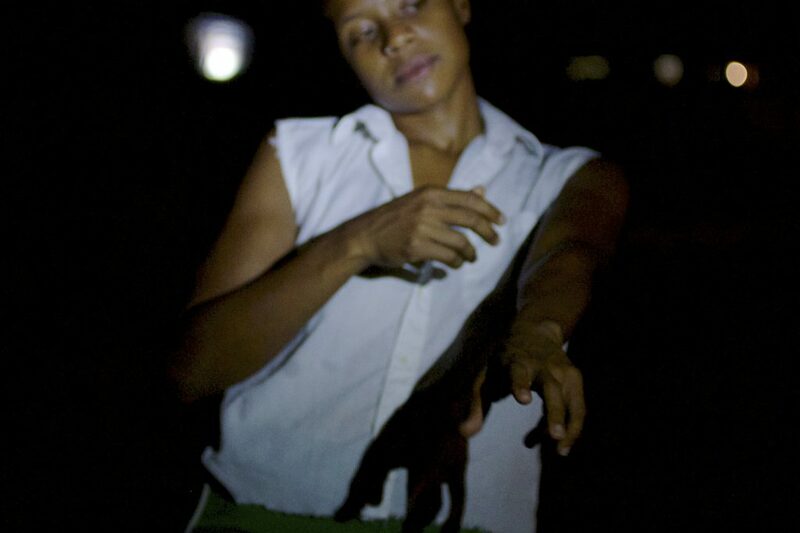 She hosts cultural events in her house, in a primarily Afro-Caribbean and post-industrial area called Carolina. Cats are very common on the island of Puerto Rico, and in this video, the cat is cast as a mythological entity, capable of world-altering transformations. The soundtrack further blends time and space as it alternates between a track from the Peruvian punk band, Los Psychos, and the chirping and croaking music of the coquí frog that populate Puerto Rico’s wet landscapes. These elements combine to imagine a spell that can destroy military industries, confronting the complexities of this system on a poetic plane rather than a rational one. Beatriz Santiago Muñoz lives and works in San Juan, Puerto Rico. Her approach to making films and videos resembles the careful approach of an ethnographer. She learns about the place, the site of the film, its cultural histories and local mythologies. She learns about the people who are both subject and actors. She invites them to participating through enacting their own life, or an aspect of their cultural history. They trace the contours of cultural memory, and frame political and social issues. Her work combines documentary record, indigenous historical memory, participatory inflections, chance discovery, and fictional explorations.